The great novelist Ryotaro Shiba, 1923-96, the author of one of the most popular historical sagas, “Saka-no-Ue-no-Kumo” (Clouds above the Hill), is very well known in Japan, but is little known abroad. In January 2013, Volume I and Volume II of the first English version of this saga were published. All four volumes of “Clouds above the Hill” will be completed within this year. This is an epoch-making event that will facilitate overseas understanding of Japan. Devoting an entire decade, Shiba vividly depicted in his narrative young military officers (Yoshifuru and Saneyuyki Akiyama brothers), a poet (Shiki Masaoka), and others, who played active roles in the Meiji era when Japan was emerging onto the world stage. The title, “Saka-no-Ue-no-Kumo”, depicts Japan in the Meiji era, which had just opened up from the feudal era, as an aspiring nation desperately making efforts to become a modern state. Since its first publication in 1969, “Saka-no-Ue-no-Kumo” has enjoyed a great deal of national popularity, selling more than 18 million copies in Japan. From the 1970s to the 1980s, in particular, when Japan was becoming a world economic power with constant economic growth, the saga was a spiritual backbone to support people’s energy for further progress. When the pre-war history was on the verge of being denied completely after Japan had lost the Pacific War, “Saka-no-Ue-no-Kumo” taught us that before the advent of the dismal Militarism era there had been an era when people were only thinking of going up the hill with cheerful and free spirits and when there were Japanese of great caliber. The work was carried as a series from 1968 to 1972 in the Sankei Shimbun, one of Japan’s national daily newspapers, and was carried in the same paper again recently; it was broadcast on NHK (Japan Broadcasting Corporation) as a prime-time serial drama from September 2009 to December 2011, gaining high popularity. Ryotaro Shiba wrote many other historical novels and travel writings, but as his idiosyncratic writing style has discouraged translations; consequently his works are little known overseas. Many people are therefore delighted with the publication in English of “Saka-no-Ue-no-Kumo”; it is expected that the saga will be read by many people in the world as a good means of understanding the particular way of Japanese thinking. 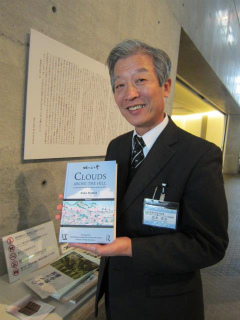 Mr. Sumio Saito, President of the The Japan Documents in Matsudo City of Chiba Prefecture, set out the project to publish “Saka-no-Ue-no-Kumo” in English. As he had been involved in importing foreign books to Japan for about 45 years, he established the publishing company upon his retirement in 2001, making up his mind, “From now on, I will convey Japan’s publishing culture to the world.” Though there had previously been an attempt to publish “Saka-no-Ue-no-Kumo” in English, the vast length of the novel---eight volumes in the pocket size edition, Shiba’s idiosyncratic writing style, and other problems such as historical background and terms, had left the translation unfinished. “If I don’t do it now, it will never get done.” This sense of mission urged Mr. Saito to start the project. 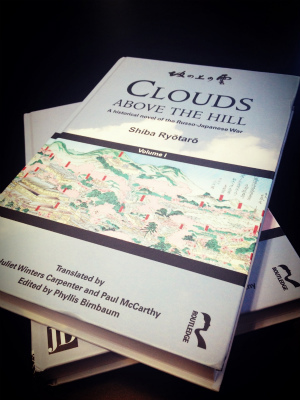 “Clouds above the Hill” in four volumes will be completed with cooperation of Paul McCarthy, Professor of Surugadai University and Juliet Winters Carpenter, professor at Doshisha Women's College of Liberal Arts, seasoned translators well versed in Japan, and others. 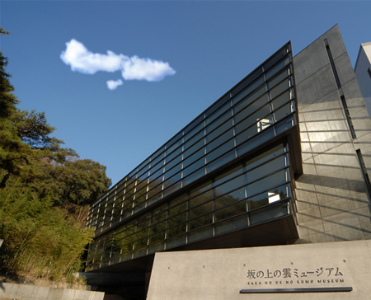 As the central facility of the “Saka-no-ue Field Museum Scheme,” which is to make the whole city of Matsuyama a roofless museum, the Museum opened in April 2007. The museum is planned in consideration of the history and culture surrounding Matsuyama Castle, and its appearance is in harmony with its natural surroundings. The stairs (photo center) leading from the entrance hall to the top floor give pedestrians the impression of walking up to the clouds above; it is said that Mr. Tadao Ando, the architect, has re-created an image of “Saka-no-Ue-no-Kumo” (Clouds above the Hill) in the museum. On the slope between the third and fourth floors are huge panels called the “Wall of Newspapers,” carrying all the 1,296 clippings of the installments of “Saka-no-Ue-no-Kumo”, Clouds above the Hill, which were carried in the evening editions of the Sankei Shimbun from April 1968 till August 1972. Using various written materials and video clips, the museum also introduces some characteristics of the Meiji era when Japan started transforming into a modern state, centering on episodes of Shiki Masaoka, Yoshifuru Akiyama, Masayuki Akiyama, who are protagonists in the novel. Besides them, the museum features special events on different themes every year, attracting many people in and out of the prefecture.